Your success begins with your daily habits. If you study successful people, you’ll find that the things they do every day greatly impact the outcomes they experience. You don’t need to figure it all out for yourself. All you need to do is duplicate the success strategies of successful people. Success is the sum of small efforts, repeated day-in and day-out. Success leaves clues…. 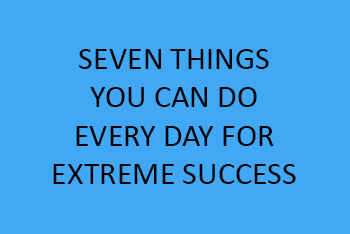 Here are seven key things successful people do every day. 1.Successful people maintain an impeccable image. 2.Successful people seek out new information. Successful people are lifelong students! Successful people love to be sponges of knowledge. Leaders are readers and readers are leaders. Im sure you know a member of Oprah’s book club, if you’re not a member yourself. Think about this: many of the books on Oprah’s list are non-fiction books about success and self-improvement. If Oprah, one of the wealthiest people in the world, still reads to improve herself, how much more do you or I need to? You have to make learning a lifelong practice. What books are on your shelf right now? If you knew everything you needed to know to achieve the life of your dreams….you would already be living your dream life. What you don’t know can greatly hinder your success in life. You must get informed. Begin to flood your mind with new insight through books and personal development courses. Life becomes so much more satisfying when there is a constant flow of learning. Choose your top five areas of interest, and then become passionate about reading and gathering new information in those areas. Go to your local bookstore, Amazon, or my own Success Store and get a new book that will take you closer to your next level of success. 3.Successful people frame their future with pictures and words. Albert Einstein, the author of many important inventions and scientific breakthroughs, said “Your imagination is your preview of life’s coming attractions.” Successful people know how to make their dreams a reality, through the art of meditation and affirmations. Framing your future means gathering images and phrases to illustrate your dreams and inspire you to pursue your goals. Never underestimate the power of creating visual prompts using pictures and words that you can meditate on often. Becomerelentless about focusing on your photos and visualizing every day and night. Then, couple the images with positive wordof affirmation. Begin to say something in the direction of your dreams. Your words create your world. If you change what you say, you can change your life’s outcome. Take out your goals list and begin to declare your success. Always speak in the present tense, like it is already happening. Keep saying it until you believe what you are saying in your heart and mind. I challenge you to go through the exercise of putting your dream board together. 4.Successful people invest in their success. Successful people are not cheap. They understand that the best information is not free, but that it comes with a price. They recognize that they are worth the investment, and they make it happen. Wealthy people don’t ask how much something cost, they ask how much will the investment make me. To continue achieving the new levels of success, you must continue investing in information and resources to elevate your income and status. People who are at the top of their their fields, invest in books, dvd/cd tools, conferences, seminars and other resources to expand their knowledge, ignite creativity and up-level their income. You can spend one day in a workshop and learn what someone may have taken years to develop and perfect. Now more than ever, smart entrepreneurs are fast-tracking their success by investing in themselves first. You are certainly worth it. Find a conference or seminar that’s relevant to your success track, and register for it! If you’re not sure where to start, check out my Ultimate Success Tour or International Women’s Success Conference. 5.Successful people write and live by lists. What gets written, gets tended to and what gets tended to gets DONE! What’s written is real. Learn to list your life. You will feel constant pressure until you develop a system to handle the running to-do list in your mind. Writing lists provides you with a system, which helps organize your thoughts and improve your performance. Listing your life daily will bring about solutions and help you keep an orderly state of mind, so that creativity can abound. Your pen and paper can empower you to progress. Keep a journal and record your thoughts and ideas in it daily. Plan out every aspect of your life on paper. Writing is a powerful solution for success that you can practice daily. A great way to create your lists is with Astrid. Astrid is an excellent app (available for iOS, Android and web) that syncs your lists across your smartphone, tablet and the web. 6.Successful people pay attention to their money. They know that money likes attention! Media mogul Ted Turner put it simply, “Life is a game. Money is how we keep score.” What you focus on, you will attract. Adopt the mentality that making money is easy. Allow yourself to believe it. People become millionaires every day—why not you? You must be a millionaire in your mind before you ever see the funds in your bank account. I believe that we are all created with an innate ability to prosper. When you give attention to your money, you will find ways to make more of it. Focus on increase and not on lack. You have something to offer the world that no one else has. I am a true proponent of profiting from your passions. Tap into your skills and expertise to generate greater income for yourself. Take an assessment of your current financial situation and set 5 money goals for yourself today. 7.Successful people take daily action toward their goals. Billionaire, Richard Branson (founder of Virgin Mobile, Virgin Atlantic Airways, and many other successful businesses) said it this way, “I don’t think of work as work and play as play. It’s all living.” Whether you’re ‘at work’ or not, your daily actions should take you closer to your success. Everything you want is on the other side of what you won’t do. Jut beyond your comfort zone is the life of your dreams! You must lose your love for being comfortable if you want to reach your goals. Comfort is an enemy of success because it lulls you into complacency. The best way to stretch yourself and get uncomfortable is to take action. To get what you’ve never had, you must do what you’ve never done. Do something every day toward your goals. What can you do for 30 minutes every day that would put you ahead of the game? Great success takes great effort—but the rewards will be far greater than you can ever imagine! Today, write down three ways you can build success actions into your daily routine.